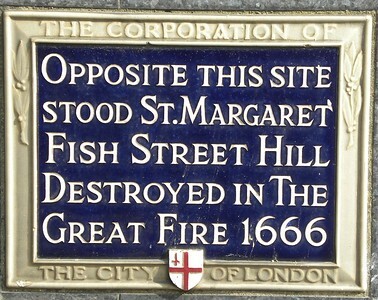 •	St Margaret New Fish Street was located where the Monument now stands in Bridge Ward and was one of the churches never to be rebuilt. •	Variously called St Margaret Bridge Street and St Margaret Fish Street Hill, it dated from before 1190 and must have been prominent on the road to Old London Bridge receiving many gifts from the pilgrims who passed it on the way to and from the bridge. •	An inventory of 1472 showed an unusually varied collection of relics from portions of Christ’s crib, the bush of Moses, the rod of Moses, clothing of Mary the mother of Christ and a tooth of St Brigid. •	The church is mentioned in two City Ordinances, one of 1311 requiring lampreys sent from France to be set out for sale under the church wall immediately upon arrival in this country and the other of 1379 mentioning the conduit beneath the wall as one of two places where fresh fish could be sold. •	Following the fire it was united to St Magnus-the-Martyr.